Thermo Fisher Scientific Inc says the Center for Experimental Bioinformatics (CEBI) at the University of Southern Denmark is using Thermo Scientific nano-ultra high performance liquid chromatography (UHPLC) technology to accelerate productivity and improve efficiencies during its proteomics research. Implementation of the Thermo Scientific EASY-nLC 1000 has enabled 34 percent more peptide and 22 percent more protein identifications within the CEBI laboratory, significantly increasing productivity. Additionally, the instrument has improved separations and facilitated the analysis of more complex samples within the laboratory. Based in Odense, the University of Southern Denmark’s Department of Biochemistry and Molecular Biology is world-renowned in the field of proteomics, with research focusing on gene structure and organization, regulation and RNA translation. CEBI is a specialist proteomics research laboratory, aimed at applying modern methods of mass spectrometry and proteomics to functional analysis of genes. Prior to implementing nano-UHPLC technology, CEBI used conventional HPLC. However they needed a more complete solution, such as EASY-nLC 1000, to accelerate productivity and improve efficiencies. 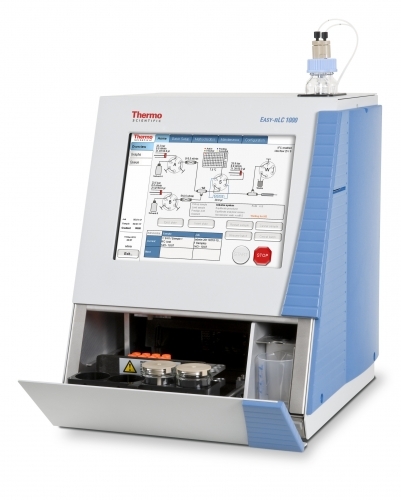 The EASY-nLC 1000 is used in conjunction with Thermo Scientific ion trap and Orbitrap mass spectrometers for a wide range of proteomics research, including the study of complex mouse dendritic cells. beads has improved separation and ionization, enhancing sensitivity and allowing the CEBI team to scale down experiments and reduce costs.